Hard Cover, 160 pages, 9.75 x 11.75. Here's a fantstic, colorful look at collecting breweriana from the U.S. and elsewhere. Lots of rare and beautiful pieces of breweriana pictured and discussed. The section on beer labels is particularly well done, featuring some truly spectacular early labels. 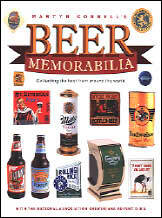 Also includes a handy list of breweriana web sites!